Home / The Collar Speaks / Oxford Shirts- The Ivy League of a Gentleman’s clothing! Oxford Shirts- The Ivy League of a Gentleman’s clothing! The Oxford shirt is essentially a timeless piece of clothing that can spruce up a man’s look! I as a fashionista strongly believe, a man must have a few Oxford shirts in his closet (other than the skeletons we normally have there...) besides all the other tees and shirts and this and that! A style element of Victorian gentlemen of the early 19th century, traveled to the East Coast of the United States to be adopted by the Ivy League school boys of the 50’s. It was one of four shirt fabrics named after illustrious universities; the others being Cambridge, Harvard and Yale. Of these only the Oxford remained till the modern times while the others disappeared into oblivion! But why did Oxford shirt remain the last man standing in its league? Well, no one knows but I can surely go on a quest to find what happened to this poor fellow! But till then let us simply believe it is an indisputable classic piece of clothing for over 200 years! The shirt derives its name from the fabric that was used to make the garment - a cloth originating in the 19th century in Great Britain. But as the world would have it, the American marketers made it so popular in the States with the Ivy League association, that eventually the Oxford shirt became more American than British! Why…don’t you remember the young and handsome John F. Kennedy becoming the ultimate Ivy League poster boy by personifying the Oxford shirt? 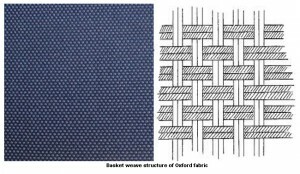 A Scottish fabric mill began making Oxford cloth from cotton in the 19th century. 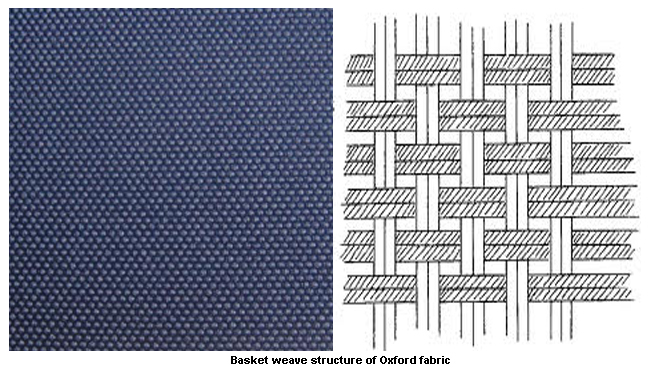 Traditionally woven in cotton, the Oxford fabric is made of two fine yarns woven against a heavier yarn in two different shades- a color and the other one mostly white. This color contrast gives the cloth its distinctive pattern. Its subtle lustrous effect makes it perfect to make dress shirts and for casual-to formal shirts! It's a bit thicker in weave giving it a raised finish, resulting in a fabric that is wrinkle resistant. The fabric has a distinctive basket-weave pattern, which makes the fabric breathable, despite being thicker than regular cotton. A perfect fabric for the tropical weather- breathes easy, wrinkles less, what could you ask for more? Aren't we all blessed to have Oxford shirts in our generation! 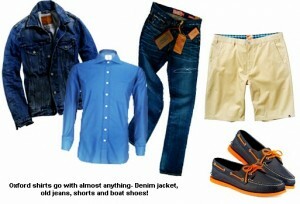 As ubiquitous as the Oxford shirt is, it goes with any dressy or casual clothing. A light blue, peach or green, sets in perfectly with a pair of worn in denim. Just roll up your sleeves (I mean literally here…) and you got that ace poster boy look! Oh am sure your lady wouldn't mind, my mate! Ever thought how well pink goes with grey? I mean seriously fellahs! Who said men don’t wear pink! They absolutely do and they absolutely look blinding! Don’t miss our very dear Bond… James Bond of course! He absolutely nailed it with a pink Oxford shirt and a cream suit in ‘On His Majesty’s Ship’! 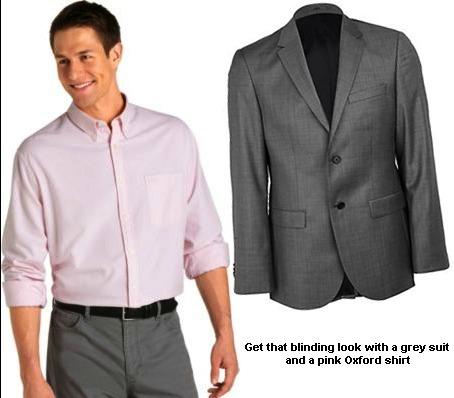 Try a grey suit with a soft pink Oxford shirt! Wear a silk tie or not, you already got the ‘femme’ attention and some envious eyes rolling! Wear it with a cardigan, a v neck sweater or shorts, and add the Ivy League charm to your style! Oh did I miss the boat shoes? Just about right, to go out with your mates or throw a denim jacket for a casual movie date!The versatility of the modern Oxford shirt makes it wearable with almost anything!